Take One Small Step Toward Sustainable Packaging. 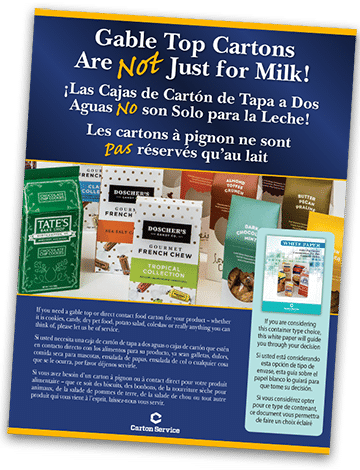 Consider our Gable-Top Carton for Liquid Packaging. With new equipment and new capabilities, Carton Service can help you with your liquid packaging needs. We are ideally set up for small to mid-size runs with sizes ranging from pints to quarts with or without caps. 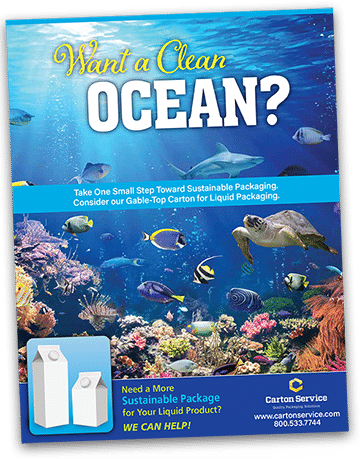 Providing great billboard space for your messaging, gable-top cartons are mostly recyclable* making them more “ocean-friendly” in helping to reduce the amount of plastic in our oceans. If you want more information about our liquid packaging capabilities, fill out the form below and you can download our latest flyer on liquid packaging and also for dry and semi-solid gable-top packaging (with or without windows). 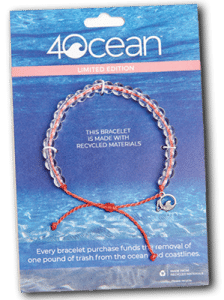 When you fill out our form for more information, we will enter you in a weekly drawing for a 4ocean bracelet. This bracelet, made of recycled materials, purchases the funds for the removal of one pound of trash from the ocean and coastlines. We are proud to support this unique effort to clean up our world. * Carton recycling is available in 82% of the Top 100 U.S. Markets in 49 states. That’s over 72 million households! Fill out the form below to download our flyers on Sustainable Liquid Packaging and Gable Top Packaging.